I think if I could only ever grow one thing, without a doubt it would have to be tomatoes. One of my earliest memories is helping my grandad in his greenhouse and even now, the smell of a greenhouse full of tomatoes on a sunny day takes me back to when I was three years old. Since then I have always associated gardening with growing tomatoes before anything else…plus I love them! In the past I have tried growing different varieties with mixed success. Central Scotland doesn’t have the same climate as Naples so the San Marzanos that you see dripping off Italian balconies did not quite live up to expectations. So this year I decided not to be clever and stick with what I know works and tastes good – Sungold, Red Cherry and Moneymaker (my grandad’s favourite). 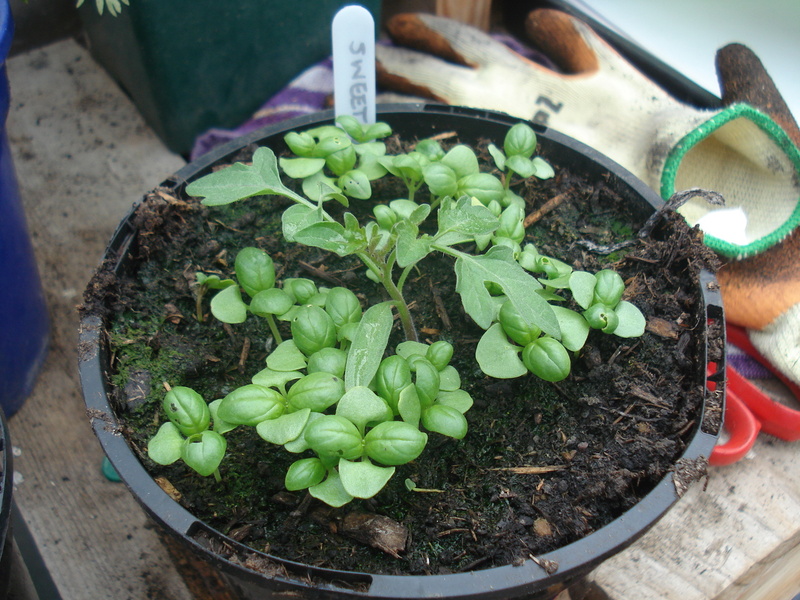 Having started early, sowing my seeds in February, I then lost all my plants to frost in April. I started again, gutted at having lost my 7 week head start and finally, last week, my boys were all ready to be planted in their final growing spot. My boys are raring to go. 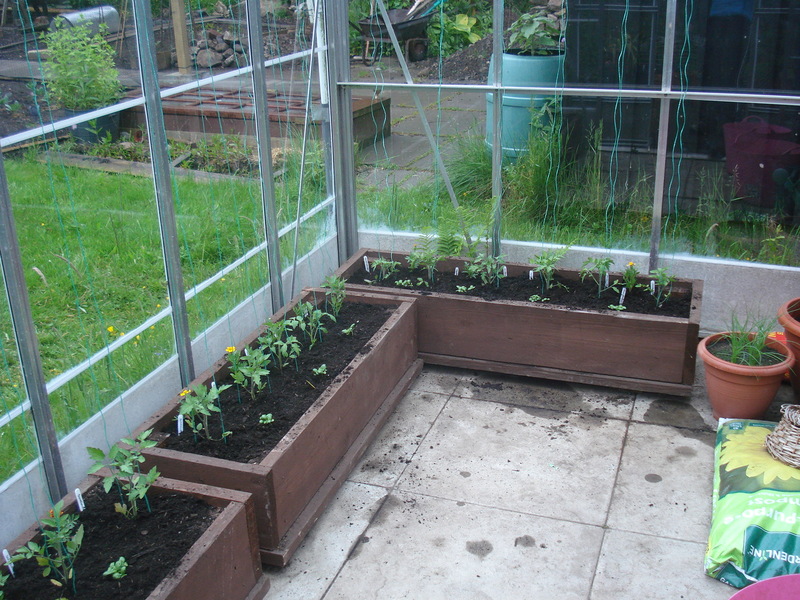 Last year Mr Mac made me some troughs which I used for growing tomatoes, melons and squashes. 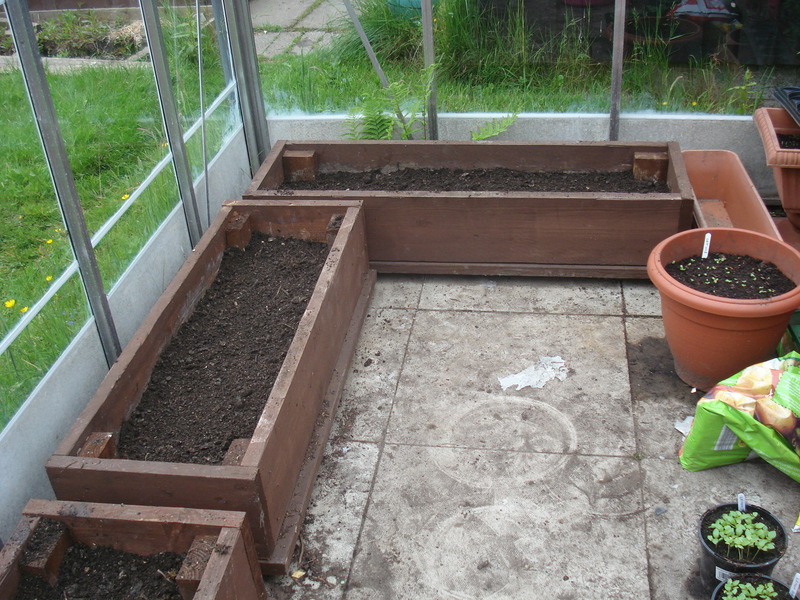 The mistake I made was putting weed membrane along the bottom to stop the compost falling through. I did not put in any drainage either and I don’t think my plants were very happy. This year, I learned from my mistake and filled the troughs full of stones first for drainage then added a layer of our own compost and topped the troughs up with growbag compost. 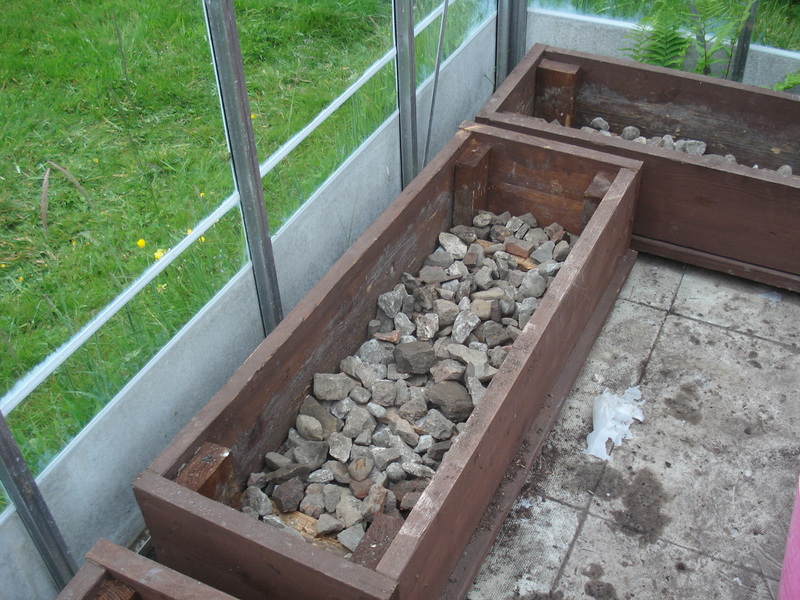 They were then filled with a layer of our own compost and topped up with growbag compost. Then I had to call on Mr Mac to do his special string trick! He thinks he saw Alan Titchmarsh doing this on tv but is not sure. It definitely works though. He runs wire along the roof of the greenhouse. Then he measures a length of string long enough to reach from the wire, down and underneath the rootball of the tomato plant, then back up to the wire. He then plants the tomato with the string underneath the roots and then ties both lengths of string to the wire. It should not be too tight but the tension can always be adjusted by untying the string on the wire and loosening or tightening as required. The string is under the roots of the tomato. 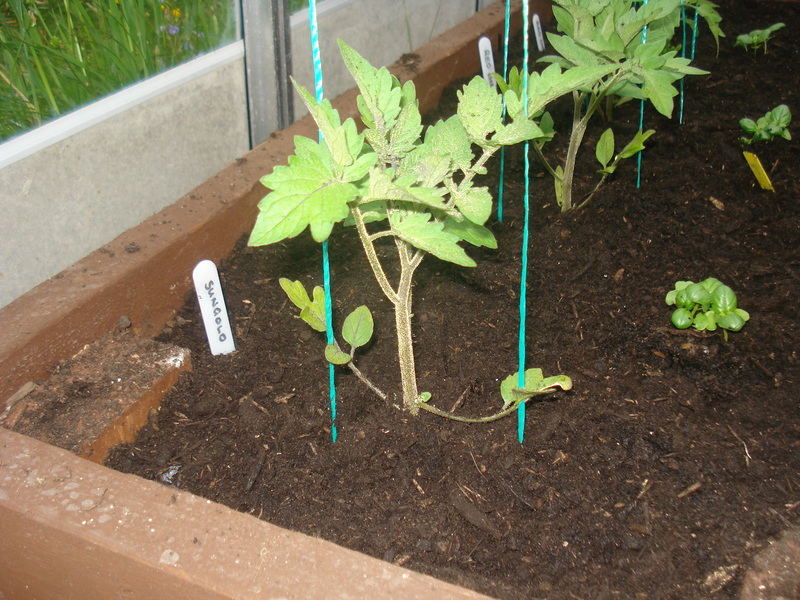 This means as the tomato grows you can wrap it round the string and this provides all the support it will need. All happy in their new home! Finally, I planted some French marigolds and basil in between the tomatoes to deter whitefly! A little tomato plant is growing in the basil! I checked my book and last year I planted the tomatoes on 25 April. This year it was 8 June! Now all we need is some sunshine although a friend told me that lining the greenhouse with foil or mirrors can increase the light to help them grow….I would prefer sunshine though so fingers crossed. This entry was posted in Vegetables and tagged basil, compost, drainage, french marigolds, growing tomatoes, moneymaker, red cherry, string, sungold, tomatoes. Bookmark the permalink. Try growing Gardeners Delight—lots more flavour than Moneymaker–or Shirley and use seaweed feed(you can make your own by collecting seaweed from the shoreline–good excuse for a day at the coast!! 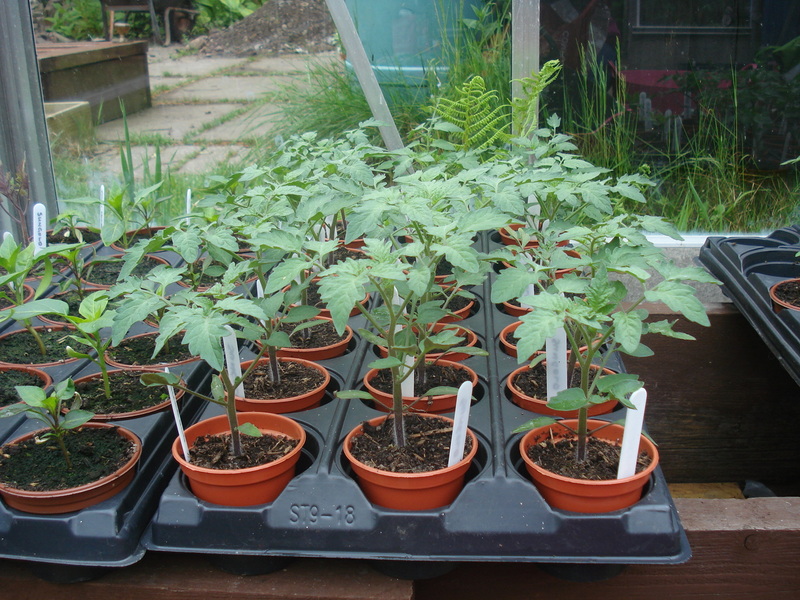 )or you can buy at the garden centre,Good luck with the toms–they look happy in their new home. Thanks. I think Sungold are sweeter than Gardener’s Delight and normally I would grow both but decided to just stick to the three types this year. At the rate we’re going it looks like it will be green tomato chutney I’ll be making! I ;love your troughs. Fingers crossed for some sun. .
Oh the wonderful smell of tomatoes growing in the greenhouse! I am green with envy! This is my first year without a greenhouse and I am suffering from serious withdrawal symptoms. I love that tomato in the basil pot – what a chancer!